Swappable faceplates on the Xbox 360 wasn't a bad idea, says the console's marketing boss but, looking back, it came in a little late, especially for a fad based on mobile phones. "We don't ever create an accessory with the intent of having it fail", Albert Penello told Official Xbox Magazine. "The idea wasn't bad ... people used to put faceplates on their cell phones. Rewind five years, faceplates were what everybody wanted to do." Rewind four years,though, and people had already given up on it for the 360. Modders and artists who took the time to custom-paint their consoles found the swappable faces a convenience, and there were more than a few cool pics of what some had done with theirs. But commercially the thing was a flop. "It turned out nobody bought it. We killed that one pretty quickly," Penello admits. 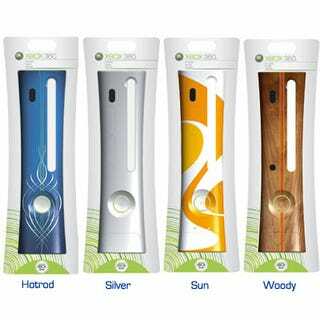 Microsoft has not made official faceplates for a few years, and the Xbox 360 Slim, of course, does not have the option. Perhaps the reason the swappable faceplate craze couldn't catch on with a console is because the thing stays in your living room 24/7; no one's pulling it out of a purse to show off at a bar or a party.